Not to be confused with Bangin' Breaks. 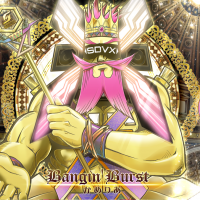 A long version of Bangin' Burst, titled Bangin' Burst ("Outburst" Long ver. ), can be found on Camellia's second major album, GALAXY BURST. A sequel to Bangin' Burst, titled Blastix Riotz, appears on SOUND VOLTEX III GRAVITY WARS. Bangin' Burst is featured in the medley KAC 2013 ULTIMATE MEDLEY -HISTORIA SOUND VOLTEX- Emperor Side, also from SOUND VOLTEX III GRAVITY WARS. Bangin' Burst is one of the winning songs of the KAC2013 Original Song Contest (KAC2013オリジナル楽曲コンテスト). It was first unveiled in the final round of the SOUND VOLTEX II -infinite infection- section of KONAMI Arcade Championship 2013, alongside the other winning song, For UltraPlayers. It was later added to SOUND VOLTEX II -infinite infection- on December 27th, 2013. 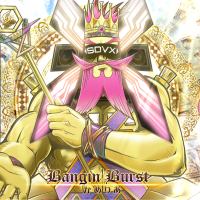 Alongside For UltraPlayers, Bangin' Burst is the first SOUND VOLTEX song to have its EXHAUST chart being rated Level 16. When playing the song, SOUND VOLTEX character Voltenizer Maxima appears in the background. They are also the first songs to have their ADVANCED charts rated Level 13. Bangin' Burst's ADVANCED and EXHAUST charts can be purchased in SOUND VOLTEX II -infinite infection- after clearing BLACK or WHITE? 's EXHAUST chart with an A rank or above, and its ADVANCED chart can be purchased separately after clearing BLACK or WHITE? 's ADVANCED or EXHAUST chart. In SOUND VOLTEX III GRAVITY WARS, its EXHAUST chart can also be purchased after playing BLACK or WHITE? 's EXHAUST chart 50 times. As of SOUND VOLTEX IV HEAVENLY HAVEN, its ADVANCED chart is unlocked by default. 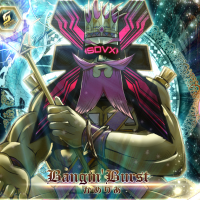 Bangin' Burst received a GRAVITY chart on February 5th, 2016 in SOUND VOLTEX III GRAVITY WARS, rated Level 16. It can be unlocked via INFINITE BLASTER. It's the first SOUND VOLTEX song to have two charts rated Level 16. Bangin' Burst is one of only two songs with Level 16 charts (other than the KAC ULTIMATE MEDLEYs) that are made by more than one effector (three for EXHAUST, five for GRAVITY). Bangin' Burst's GRAVITY chart was slightly modified on February 18th, 2016, changing certain trill sections in the second half of the song, therefore making it slightly easier. This page was last edited on 1 March 2019, at 00:55.